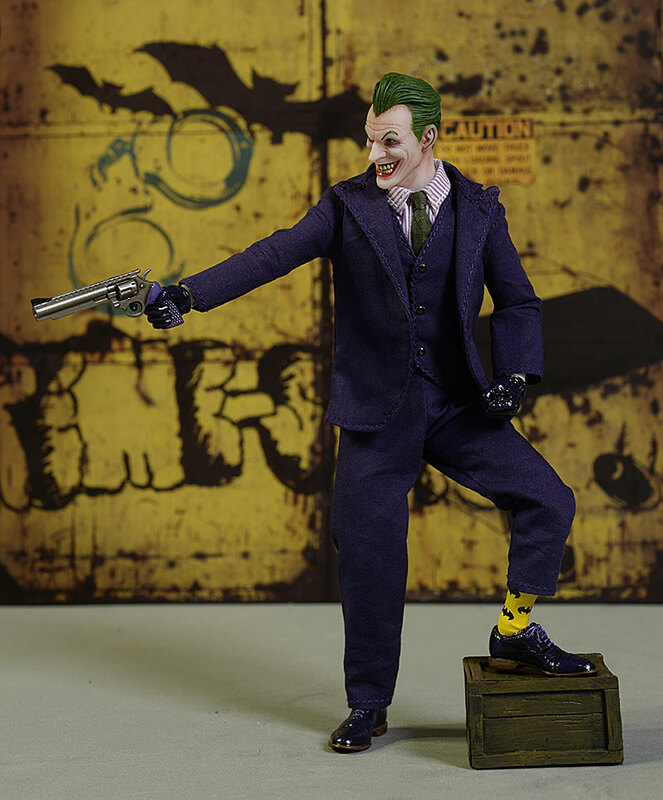 My current obsession is Mezco's One:12 Collective. I'm loving this series of figures, and it's one of the few where I'll buy any character they produce at this point. Seriously, any character. 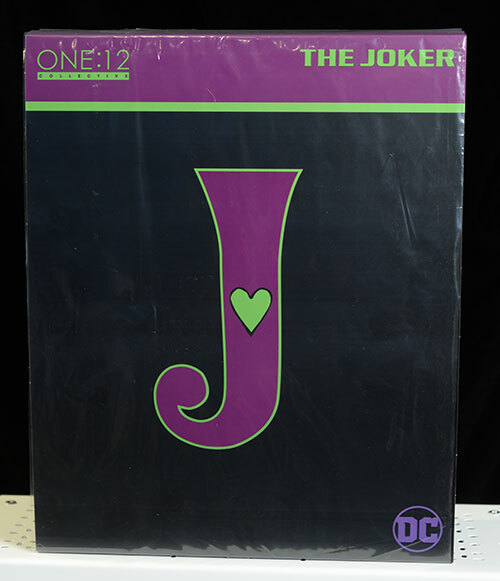 That's a dare, Mezco. There's a bunch shipping over the next few weeks, so expect a LOT of reviews of this particular series. The most recent is the Joker, who just hit my doorstep a couple days ago. Superman is right around the corner, with several more right on the verge. 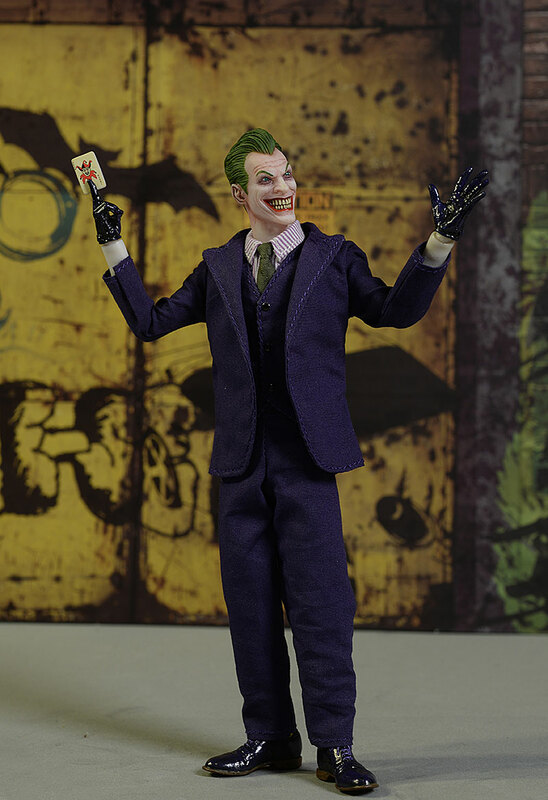 There's only one version of the Joker - no exclusives or limited editions. He's selling for $75, but like many of the One:12 figures, he's selling out fast. While the package itself remains made from very thick, high quality cardboard, this one is a little less exciting. There's some nice shots on the back, and the color scheme works, but it's on the plain side, design wise. It's all very collector friendly though, and there's no need to damage anything when removing the figure and accessories - not even a piece of tape. One of the trademarks of this series is the inclusion of two portraits for every character. Of course, I love it. 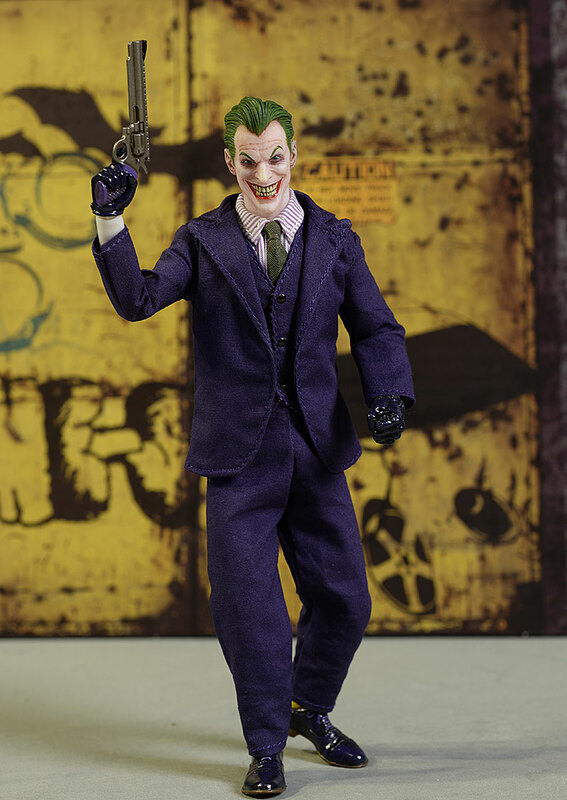 The Joker comes wearing a look with slicked back hair, wide grin, and devilish eyes. It's psychotic, it's dangerous, and it's excellent. 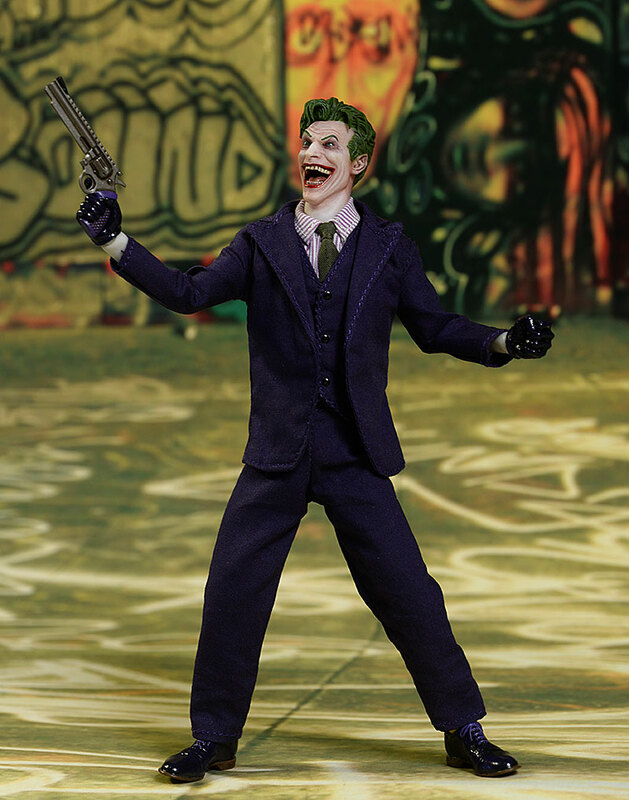 Remember, these figures are only 1/12th scale, and the Joker stands just 6 1/2" tall. Think Marvel Legends. 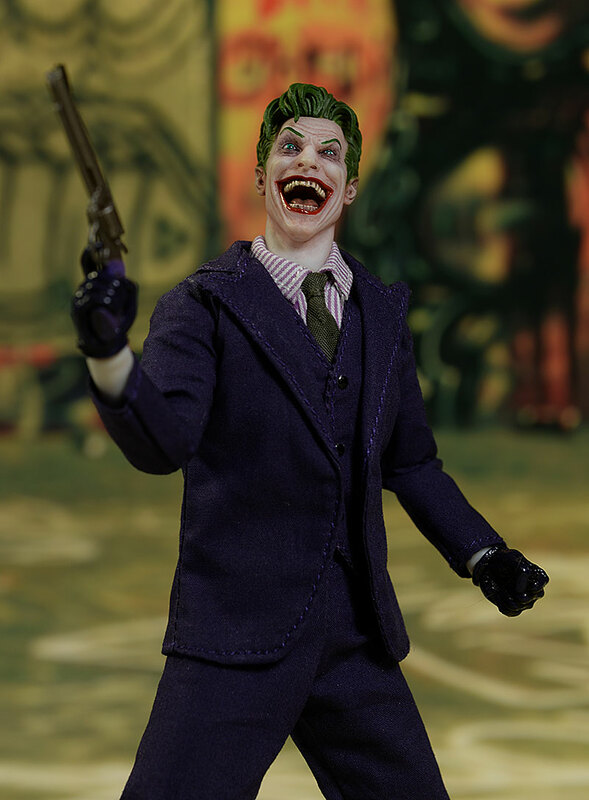 But the work around the teeth, the eyes, and the hair is something you'd expect on a high end sixth scale figure twice the size and three times the price. The second portrait is even crazier - disheveled hair and an open mouth laugh gives the impression of insanity, the sort of dynamic insanity we've seen in the comics but so rarely translated to plastic. Again, there's some truly amazing work on the teeth, and the tongue looks extremely realistic. The wrinkling on both faces follows the expressions appropriately, and the detailing in the hair is outstanding. You'll notice in the photos that he is wearing yellow Batman socks. These are actually sculpted, not cloth, a smart choice on their part. 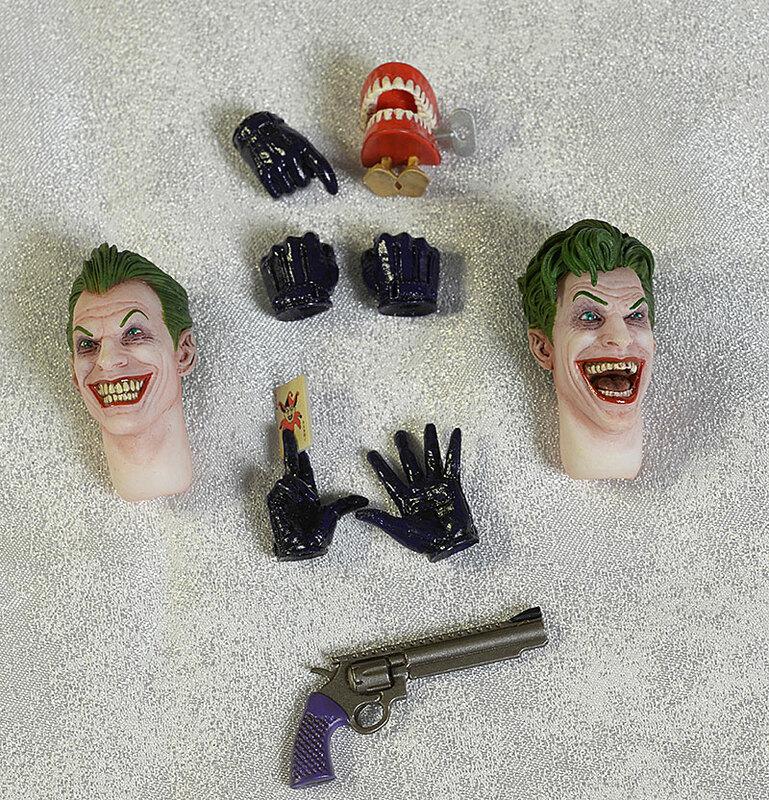 The detailing on the accessories is solid, and the hands are designed to work with the weapons. But it's the two portraits that really take this category to the next level. 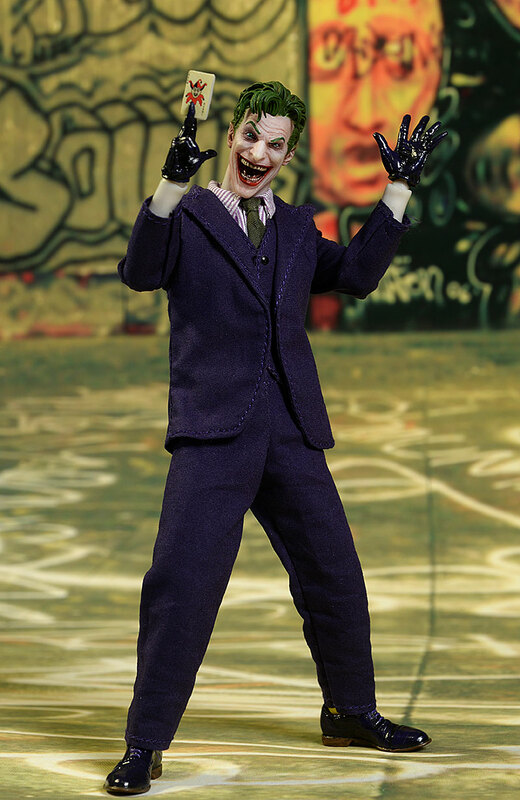 This is a Joker who's face is painted with makeup. How do I know? Because they've managed to make that clear through the excellent, realistic paint application. The wrinkles show the skin beneath properly, something that even 12" figures have had trouble with. The eyes are crazy alright, and the paint work around them, as well as the perfect eyebrow application, adds to the expression. The terrific sculpting on the mouth on both portraits is only enhanced by the perfect application of the paint. Even the hair line is subtle, with just the right transition from hair to skin. You can notice a very slight smudge on the top of the front teeth in the open mouth portrait, but man, you have to look really close in macro photos to see it. I mentioned the sculpted socks, but they wouldn't even be important if not for the fantastic yellow paint job, complete with tiny black bat symbols. It's a perfect addition that gives the figure a ton of personality. It's also worth noting the amazing detail on the shoes, from the properly colored (for this character) shoe strings, to the lighter brown soles. 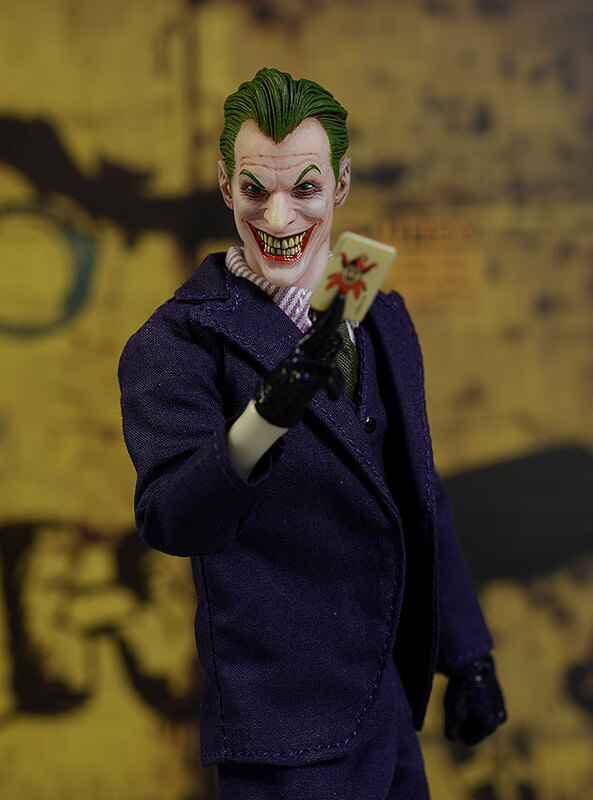 While the paint work has been excellent across the overall series, it's characters like the Joker, where the paint on the face is so much more complex, that the quality truly shines through. If you've bought previous One:12 figures, the articulation will be no surprise. This is clearly the slender body they've developed, and the joints are largely unencumbered by the costume or the sculpt. The ball jointed neck, buried in the torso, works surprisingly well, with lots of tilt and lean in every direction. Swapping heads is easy enough as well. The rotating hinge shoulders are a little restricted by the jacket and shirt, but not a lot or in any unrealistic way. The elbows seem a little weak this time around, but I'm suspecting that may be a one off situation, and the rotating hinge wrists work cleanly. The torso includes a cut waist and ab-crunch, and they work well given the suit. The hips, knees and ankles work smoothly, although I do wish there was a little more rocker movement in the ankles. My one complaint here could have been a sculpting complaint as well - I chose to stick it in this category. The wrists are odd looking from certain angles, as the arm flairs out slightly at the joint. The gloved hands do not cover this - that would restrict the articulation. But it looks odd when the sleeves ride up the forearm. Here's one category where I'm a *little* disappointed. There's two portraits, which makes me very happy, and as I discussed in the Sculpt and Paint sections, they are fantastic. Swapping is easy, and there's no trouble getting around and inside the collar of the shirt. But there's not a lot else. He has five hands in total: the pair of fists he comes wearing, a splayed left, a right holding a playing card, and a gun grip right. These swap easily as well, but remain in place. He has one large handgun, a sort of Dirty Harry .44 magnum revolver. The handle is color matched to his personal style, and it fits neatly in the properly sculpted hand. There's also the chattering teeth wind up toy. Of course it doesn't actually work, but it's a great sculpt and paint job. Finally, there's a display stand, including the clear plastic support rod. The base has the traditional 'ha ha ha' logo. They've included the small plastic bag to hold the accessories as well, emblazoned with the One:12 Collective logo. At this price point, a couple more extras would have been nice, but the second portrait goes a long way to making me happy. This is an area where I was really concerned - this isn't a single layer of clothing, like Spock or Flash. This is a multi-layer suit, and getting that in scale can be difficult for sixth scale manufacturers, let alone something this small. I had no reason to fear. The costume includes pants, shirt, vest, tie, and jacket, and all are well tailored, lay flat, and just about perfectly in scale. The material is SUPER thin. You've heard of micro fibers? This makes those look thick. You can remove the coat and have have him wearing just the shirt and vest if you'd like, although I prefer the complete look. The buttons on the vest look great as well, and the tie is superior in scale and fit to the majority you'll see on sixth scale figures. Even the coat lapels and shirt collar, two areas that are always difficult, are almost perfect. The lapels might be a *smidge* big, but it's unnoticeable in hand. The thread along the edges is more obvious in photos than in hand - it blends in, but does add a nice touch to the style. My one issue is with the length of the jacket sleeves. The shirt is short sleeved, with hemmed edges for those looking to dump the coat. But the jacket sleeves are a little too short ot cover the wrists when the elbows are bent, exposing the weird wrists. It's a pretty minor nit though, considering how many things could have gone wrong with this outfit, but didn't thanks to the attention to detail and quality from Mezco. He might have a minor nit here or there, but this is a really, really fun figure. With two crazy portraits that give you two very different versions of insanity, you can come up with a million ways to pose him. Seriously, doesn't the guy in the photo below look like he's having a ton of fun? At $75, he's not on the high end of the One:12 figures...but he's not on the low end either. Regular readers know that a **1/2 score here is 'average', and won't have an effect either up or down on my personal Overall. You're pretty much getting what you're paying for, although I suspect some collectors will feel they needed another accessory or two to justify the price. 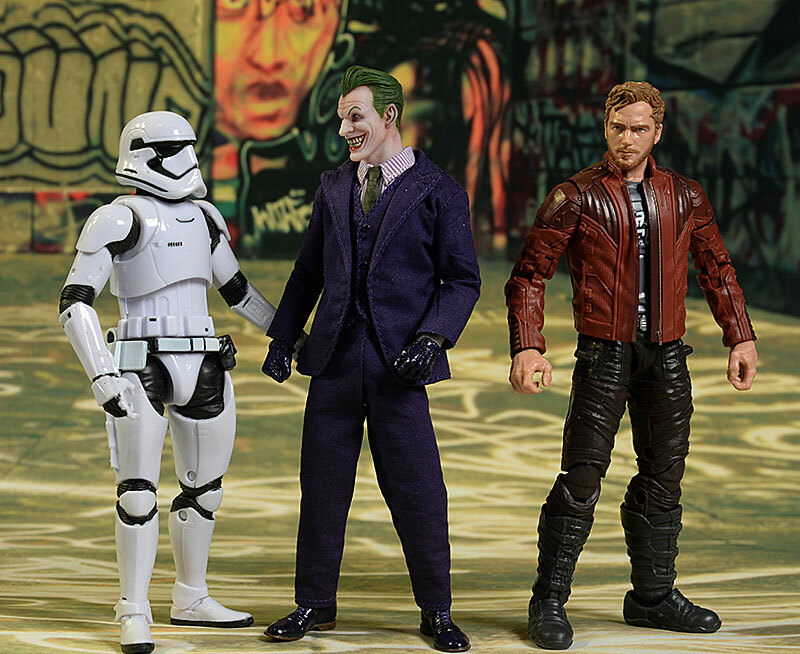 Not too long ago, I did a list of my Top Ten Joke Action Figures. The question now isn't whether or not this figure would be on a revised list, but whether or not he would take the number one spot. That's how much I like this figure. Of course, part of this love is due to my bias toward the character and toward the Batman universe in general. But even so, the nits here are few and far between. Yes, he needs another accessory or two. And those sleeves could be a scosch longer. But in hand, this is a truly impressive figure, and removes all doubt I had that they can manage just about any costume in this reduced scale. Right now my greatest fear around the One:12 series is that it will fall into the same trap we are currently seeing with Hot Toys. 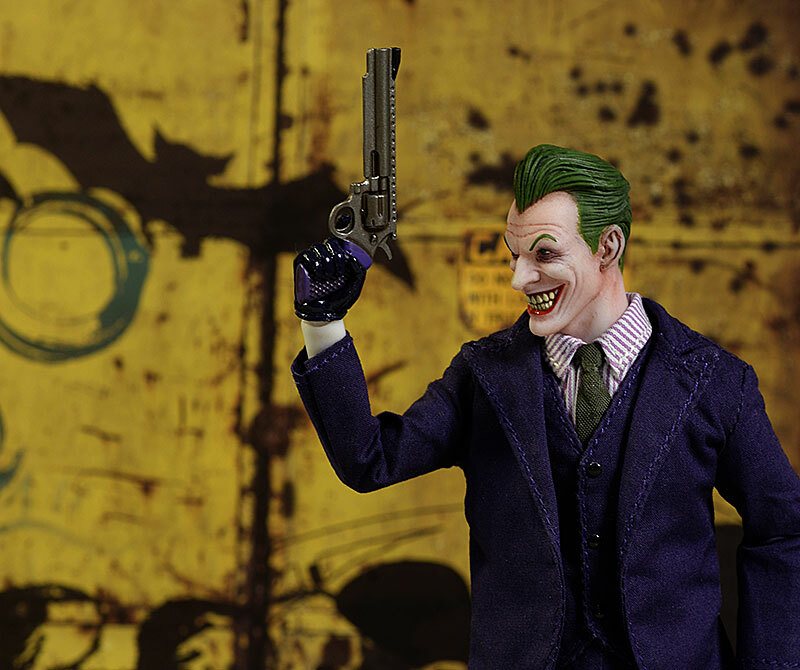 Once a company that produced a wide variety of cool characters in sixth scale, they are now pretty much down to Marvel, DC, and Star Wars for the foreseeable future. While I'm loving Mezco's DC and Marvel work, I'm hoping we continue to see them tackle characters like Space Ghost, Frankenstein, Ghostbusters, and Popeye. And don't forget - pre-ordering the One:12 you're interested in is the way to go. They are selling out quickly right now, and I don't see that changing much for 2017. - you can always pick up the figures through the Mezco store, and occasionally they do exclusives. 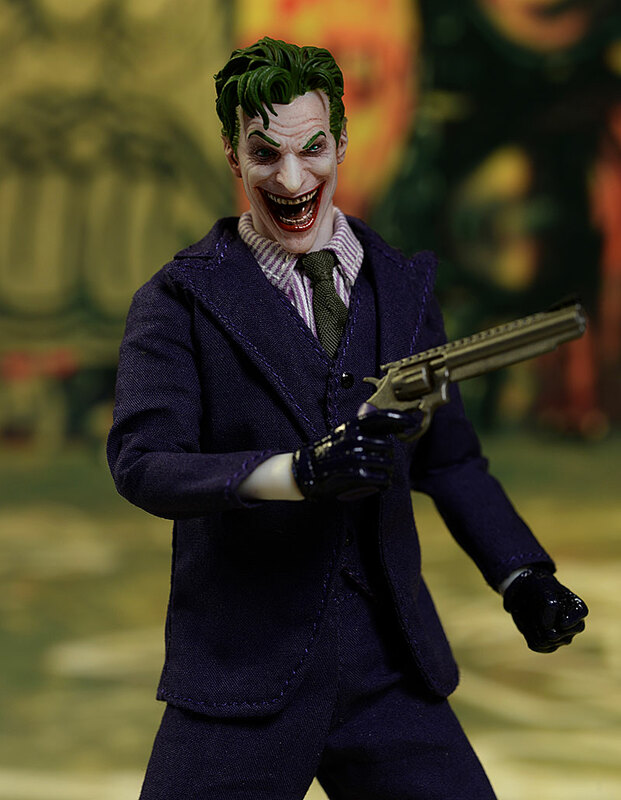 They had the Joker for $75, but he's on the wait list now. - has him in stock for $75. - also has him in stock for $75. - Entertainment Earth had him on pre-order for $75, but appear to be sold out. 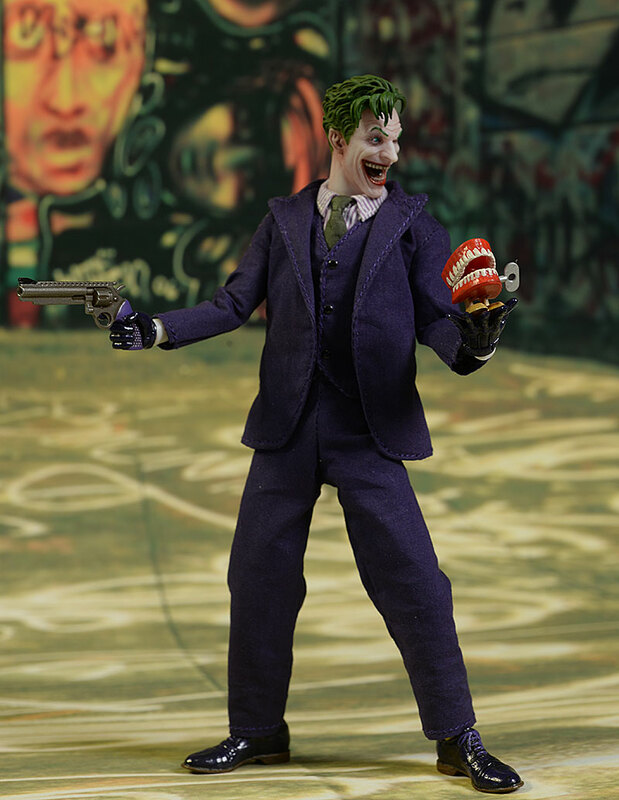 Check out my previous Top Ten Joker action figures of all time, with lots of links. You should also check out all the other reviews of the One:12 Collective figures, including the Punisher, Green Arrow, the Frankenstein Monster Diorama, Frankenstein Monster, the BvS Batman, the Bvs Armored Batman, Captain America, Star Trek Kirk, the Mirror, Mirror and Cage variants of Spock, Sulu, the Toy Fair exclusive Spock, and the regular release Spock as well. Other One:12 Collective figures released so far include Dredd and his Lawmaster, the NYCC exclusive Judge Dredd, the DKR Batman and Mutant two pack, the Batman exclusives, and the initial DKR Batman.